Terre D'Hermes Eau Tres Fraiche is the spirit of freedom, romance & adventure. Terre D'Hermes Eau Tres Fraiche 125ml. Eau De Toilette allows you to experience an unforgettable experience essential. Woody composition full of flavor ingredients with which you feel elegant and sensual. Hermes Terre D'Hermes Eau Fraiche is Tres eau de toilette for men, which literally clings to the freshness of their personal scent. About these assumptions care ingredients, such as citrus, geranium, patchouli and aquatic notes. Selected ingredients that are highly charged the character and you can fully rejuvenate. 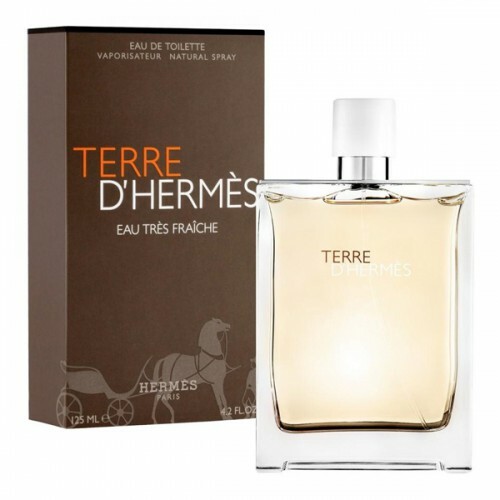 Transparent vial of eau de toilette for men Hermes Terre D'Hermes Eau Fraiche Tres has a simple style. Conventional processing, through which you can observe a slight discoloration fragrance. It is high time to enjoy the freshness of the water and secure a lasting waft around your body. This award-winning men's fragrance, with a laid-back sound expressive notes of wood, belongs to the family of tree-fern and is designed for modern and strong-minded men, who are able to immerse themselves in dreams, for a while forget about the everyday hustle and bustle and enjoy the freedom. Wood-citrus perfume luxury most unfold in the spring and summer. Initial bouquet composition built around expressive, invigorating citrus notes, chords clear and clean water, combined with bitter orange. In the heart of Terre d'Hermes Eau Tres Fraiche geranium has a warm and elegant natural amber. Unforgettable notes plume will surround you with warm woody accords, patchouli leaves tartness and refinement cedar. The bottle shape has not changed, only I got a little thinner and bought a lighter shade, but still retained the rigor and style of perfume. Eau Terre d'Hermes Eau Tres Fraiche dedicated untouched natural beauty and freedom, which is sometimes so lacking.